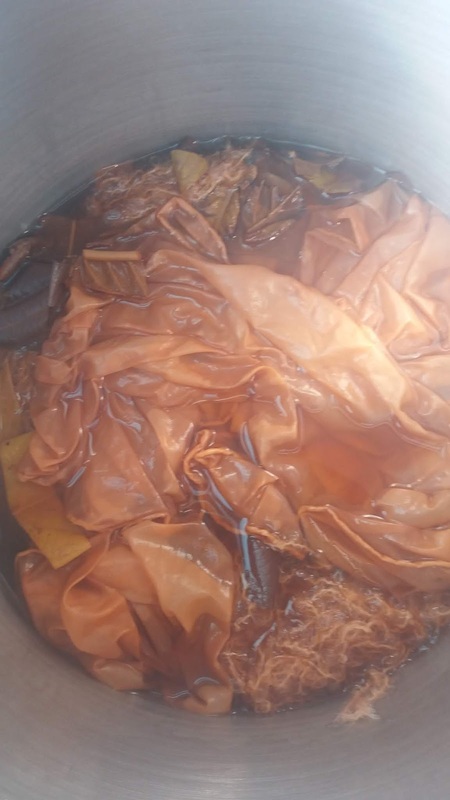 After reading this, I was keen to try some dyeing with loquat leaves so I chopped up some green leaves and added them to a old aluminum preserving pan filled with rainwater. The instructions said to simmer the dyebath until the leaves turn the water a deep pink or red. 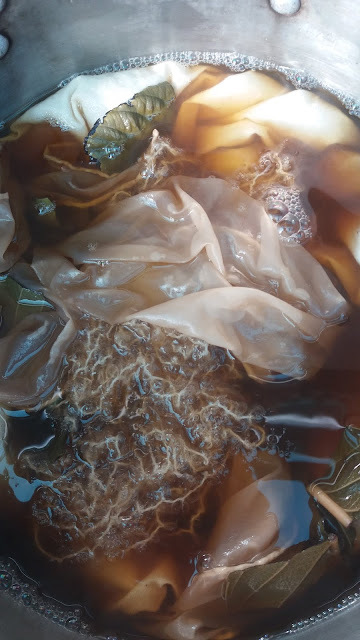 I simmered the leaves for about 2 hours and still didn't see a deep pink/red colour, it was more a peach/orange colour and wasn't that strong. After reading that fallen loquat leaves that had turned yellow had given a fluorescent peach colour I collected some yellow leaves to use separately. I chopped them up and put them in a glass jar with some rainwater and placed in the sun. Colour came off them fairly fast so I added them to another pot of rainwater. To the green leaf dyebath I added 50g alpaca yarn, a silk scarf and and a piece of old cotton sheet. I also added a few chopped yellow leaves as I thought it might increase the colour. The fabric and yarn was simmered for 30 mins and then left in the pot to cool for about 3 hours. To the yellow dyebath I added 50g alpaca yarn and two silk scarves, simmered them for 30 mins and left to cool. 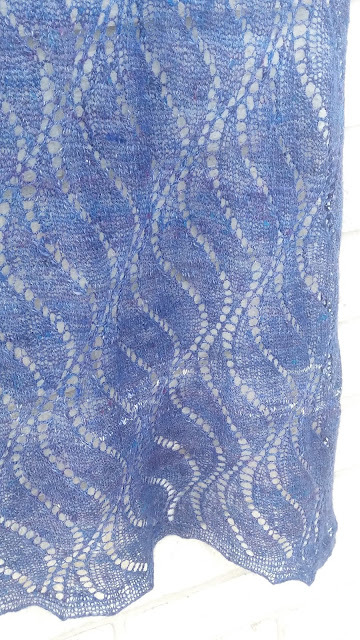 And here are the results, the alpaca yarn shows the difference between the dyebaths best. The paler colour is from the green leaf dyebath. I find it can be hard to determine actual colours on screen so I matched them up with coloured pencils to try and help. I was pleased with how well the cotton came out. Finally the silk scarves. The colours weren't too different between the dyebaths, the green dyebath produced a slightly lighter colour but they were all gorgeous. Picking leaves from the loquat trees for dyeing, I've separated out the yellowish ones as apparently they might give a different colour to the green ones. There are plenty of green leaves to experiment with as loquat trees seem to grow like weeds here, we have three mature trees and plenty of seedlings. Bonnie had to come and investigate what I was photographing. Most of the resources I have found all refer back to Sasha Duerr and her book "Natural Colour". If you have some other recommendations please add them in the comments. This video shows Sasha dyeing with loquat leaves. That took a bit longer than I expected. 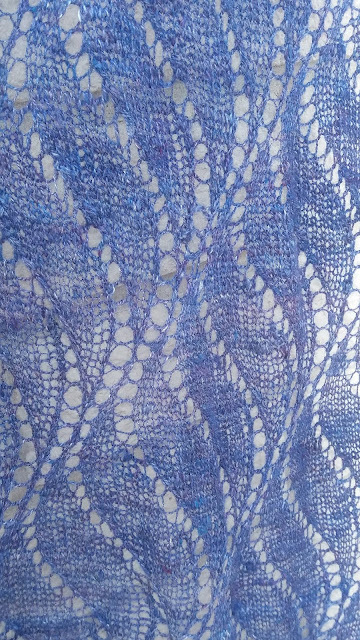 Finally finished, cast off this scarf last night and washed and blocked it this morning. 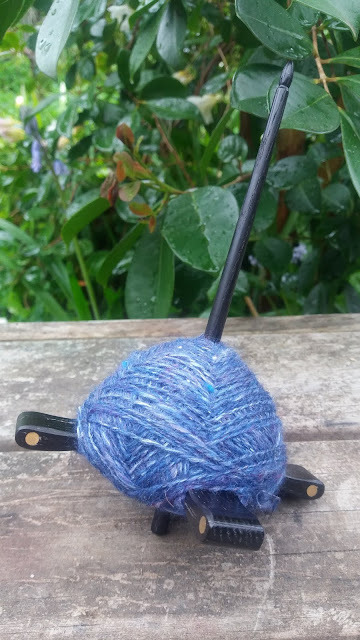 I'm not sure when it was started but I found a photo of the yarn on a spindle dating back to September 2016 so it's been a while. I should say that I haven't been working on it the entire time, I'm not that slow at knitting but I am easily distracted with other projects. 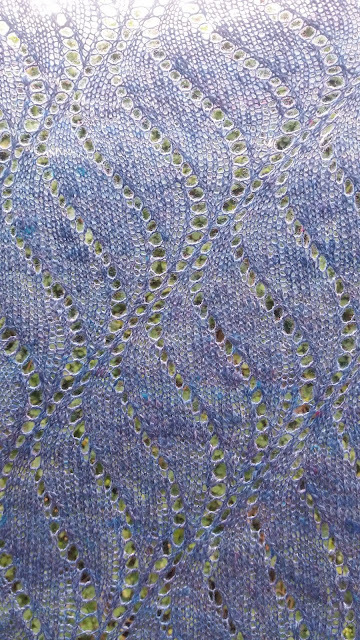 There are a few creative additions to the pattern where I managed to lose track of where I was and the spinning is not going to win any prizes for consistency but IT'S FINISHED!! And it's lovely and warm and once the weather gets colder I will wear it. 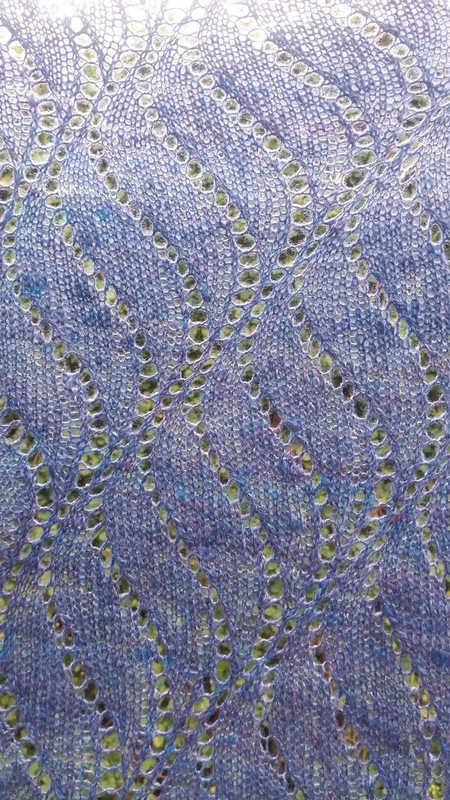 Yarn: Ashford Silk & Merino Sliver (80% merino, 20% silk), 100g, spun on a Turkish spindle.